The plans originally has you install the landing gear brackets at the end of Chapter 5 - when you have your fuselage sides nice and flat on your workbench. However, I didn't have all the hardware ready in time, so I decided to proceed to Chapter 6 and install the main landing gear brackets AFTER fuselage assembly. This did add a bit of complexity during the install, but not a major issue. I started out with raw 6061-T6 aluminum angle (2"x2"x1/4") 2ft long and cutting it into 4 sections (the approximate size to make the brackets). 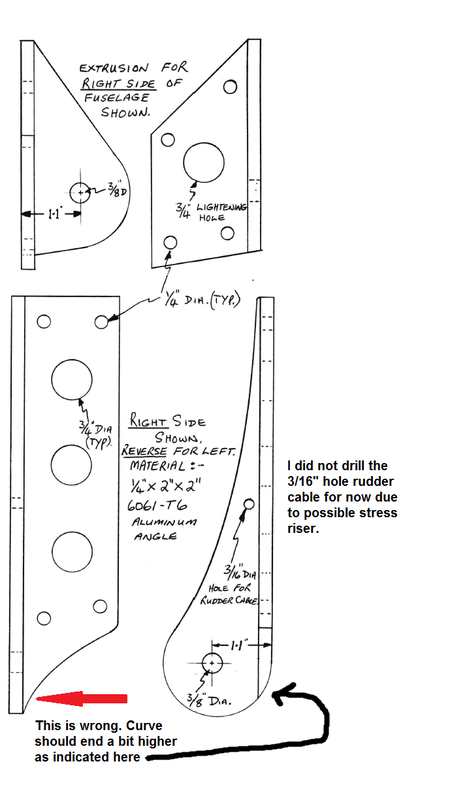 I then made all the measurements and penciled in all the drill holes and cut lines. I incorporated LPC#45 (from CP#27) to move the 3/8" holes up 0.4" on all four brackets. This moves the entire main gear up 0.4", resulting in an improved gear/fuselage juncture reducing aerodynamic drag. I should also note that the original drawings in the plans for these brackets (on page 9-3) are not drawn properly - you'll notice that the side view of the larger bracket does not end where it should on the bottom. This was probably just an oversight. As long as your holes are where they need to be, it's easy to make sense of where the final cut line goes. Also, I decided not to drill the 3/16" hole for the rudder cable - I read somewhere that this may be a stress riser and lead to potential cracks. When it comes time to install the rudder cable, I'll give this some further thought; right now, I'm leaving it out. Time to shape some metal! Using a drill press, I first made pilot holes, and then stepped up the diameter to the final size. Using a band saw, I removed as much material as possible and then fine trimmed using a belt sander/disk. Notice the rough cuts with the band saw... this is later all smoothed out and ground down to its final shape using the belt sander or disk wheel. A few builders have incorporated an improvement to the original brackets by inserting a steel bushing where the main attach bolt goes. This prevents the bolt from enlarging the aluminum hole every time you land. To do this, I purchased four press-fit bushings from McMaster-Carr (0.375" ID, 1/2" OD, 1/4" length - part number 8491A725). Using a reamer, I reamed the bracket holes to 0.500". Brackets - final shape... looking niiiiiice! It was now time to alodine the aluminum. I did a lot of homework on this and the procedure ended up being a lot easier than I thought it would. It's simply a matter of dipping the part in an acid bath (alumi prep) for 3-4 minutes... rinsing it... then dipping it in alodine for 3-4 minutes... rinsing it... and let dry. I purchased a quart kit from Spruce - follow the directions as indicated on the bottles. Nice golden color... exactly what we want! After letting the parts dry overnight, it was now time to install the metal bushing. At work, I have access to some pretty cool stuff - like liquid nitrogen. So I took a little into a styrofoam cup, bathed the bushing in it for a minute or two... dropped the bushing in place... and let thermodynamics give me the perfect press fit. Relax... this is completely overkill and completely not necessary... I could have just as easily done it by placing the bushings in my home freezer. But seriously, if you had access to liquid nitrogen, wouldn't you?! With the brackets complete, it was time to match drill them onto the fuselage. This is where it got tricky. If installing them at the end of Chapter 5 as the plans indicate, you have your fuselage side nice and flat laying on your workbench. When installing with the fuselage already assembled, the walls are not flat AND you have a rear seat in the way - making drilling extremely difficult. I started out by making pilot holes and then stepping up the diameter. The brackets closer to the firewall were easy to match drill. Since I did not have the seat in the way, I drilled through from the inside. Drilling the brackets closest to the rear seat was the tricky one. Some of the holes were so close to the seat that there was not enough room for the drill to fit - leaving me with no other option but to drill from the outside. Problem with that was if I was even a degree off, the hole would then not align with the bracket. To overcome this problem, I started out by using the smallest drill bit possible and hoped for the best. This would get me close enough to where I can then bias the angle to the proper direction as I stepped up the diameter with larger drill bits. By the time I was drilling with a 1/4" diameter bit, the whole was in the exact location I wanted it to be. This of course had to be repeated for the other side! Also, I removed some material from the rear seat to allow for the removal of the main bolt. Originally, I was planning on using off-the-shelf parts to make my LMGA assembly (the steel tube with bushings as described on page 5-3; however, I was having a hard time finding bushings that matched the ID and OD that I needed. After going back and forth, I finally caved in and purchased a set of LMGA assemblies from CG Products (aka - the cozy girls). They shipped within 3 days and before I knew, I was ready to install the brackets into final position. A note about the hardware used - a few builders have suggested to replace the outside washers (the washers that go on the outside of the fuselage) with much larger ones. This all comes from a few cases where some Long-EZ owners have reported that their brackets have come loose after a few years of service. I liked the idea of swapping some of the washers on the outside of the fuselage for larger ones (AN970-4 washers). I kept the original ones (AN960-416) for the bolts that attach to the lower longerons so that the washer would not interfere when glassing the outside skin. Also, some of the washers needed to be grounded down to make them fit. One more note about washers - the plans (on page 5-3) calls for AN960-416 washers (there must have been a typo in the original plans BOM since it calls out AN960-416L under the Chapter 5 BOM). The 'L' stands for light series and so is a much thinner washer - I decided to stick to what it calls for in the actual chapter instead of what is called out in the BOM. Here I cut the foam and cleared room for the washers. I tried to remove as little foam as possible; however, I later removed much more foam to allow easier patch up foam work (seen later in this post). With all the hardware set and the attachment points cleared, I mixed up some wet flox and applied it onto the brackets. I installed a bolt on the left bracket and one on the right bracket. This held the assembly in place. I then inserted all remaining bolts. The bracket side gets regular AN960-416 washers all around... followed by the MS21042-4 nuts. Side view... notice the regular AN960-416 washers on the lower longeron... and the larger AN970-4 washers for the upper longeron (ground down to make them fit and avoid fouling). Notice the wet flox oozing out of the bracket... this was later wiped clean. Urethane block in place... much easier than having to try and make a round/oval piece. After a full cure, it will be sanded nice and smooth and ready to be glassed! Glad I could help, Russ! Unfortunately, those 'LMGA-B' bushings (the ones that go inside the LMGA tubes - on page 5-3 in the plans) are not a standard size. I was hoping to find these as an off-the-shelf item, but ended up purchasing them from the Cozy girrrrls - they did a fantastic job. The bushings that get pressed into the brackets themselves are available off-the-shelf. I got those through McMaster-Carr (0.375" ID, 1/2" OD, 1/4" length - part number 8491A725). Hope that helps! Good luck! Feel free to contact me via email if you have any other questions! Congratulations again for the blog,it is excellent, I am looking forward to reading new posts. I need to ask you something: CG Products is out stock of LMGA brackets and I have seen the difficulties you had during their installation after fuselage assembly. I have though on making bracket holes before to assembly the fuselage (I will make a full size drawing on my CAD tool), to reduce installation problems you dealed with. Do you see any inconvenence on it? My main doubt is to be sure CG and original holes separation are identical. Will galvanic corrosion be an issue with the pressed-in steel bushings? It shouldn’t be an issue. The bushings are hardened steel (-0.85V on the Anodic index) and the 6061 aluminum is about -0.9V – a delta of less than 0.25V which is a good typical threshold. Also, the galvanic corrosion of aluminum is usually mild, except in highly conductive media such as i.e. slated slush from road de-icing salts, sea water and other electrolytes. The contact area must be wetted by an aqueous liquid in order to ensure ionic conduction. Otherwise there will be no possibility of galvanic corrosion. I’m assuming there will be no aqueous liquid in that area.